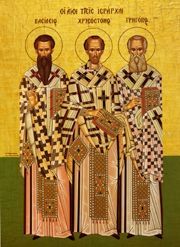 Our fathers among the saints Basil the Great (January 1), Gregory the Theologian (January 25), and John Chrysostom (November 13) are known as the Three Holy Hierarchs for their leadership of the Church. Their shared feast day is celebrated on January 30. During the eleventh century, disputes raged in Constantinople about which of the three hierarchs was the greatest. By the will of God, the three hierarchs appeared to St. John Mauropous ('Black-foot'), Bishop of Euchaita (June 14 or October 5), in the year 1084, and said that they were equal before God: "There are no divisions among us, and no opposition to one another." St. John chose January 30 for their Feast, thus peacefully ending the controversy. They are sweetly-flowing rivers of wisdom filling all creation with springs of heavenly knowledge. For You alone are glorified in Your saints! This page was last edited on October 15, 2011, at 22:11.